For the record, while I am a dog person, I do not dislike cats. In fact, I absolutely love how adorable their behaviour, in general, is. If only that also applied to the feline in Cat-A-Strophic, but that’s not even remotely the case, as this cat is hellbent on destroying every last item on the shelf. Guess the player somehow pissed her off before the game even began? Oh boy. Equipped with a pair of disembodied pink oven mitts (wait, what? ), your only choice is to follow the cat as it moves along on a path of destruction, pushing everything over the edge, ruining one vase, alarm clock, mirror and lamp alike. Nothing is safe from this crazy kitty, which kinda makes me wonder just what happened that put it in such a sour mood? Not that we’ll likely ever find out though, so best to instead focus on keeping the chaos to an absolute minimum. If possible. Which it really isn’t. You’ve managed to angry the Queen of the house and now she’s out for vengeance! Time to take responsibility for your actions and pay the consequences! See, using a combination of either WASD/arrow keys or the left/right stick on a controller, you’re tasked with moving both mitts simultaniously, grabbing items as they fall and moving them safely into the basket. Oh, and for some reason, the basket moves of its own volition, adding yet another problem to deal with as you struggle to avoid smashing items together… as each mitt can only carry one thing at a time. And every time you fail to secure an item, money’s deducted from the counter shown in the top left corner. Because… you’re ordering a replacement immediately upon losing something? Weird stuff. Whatever the case, run out of money and it’s game over. No second chances and, unfortunately, no statistic showing, say, how long you survived the onslaught, or anything of the sort. Would have been neat and might have added some replay value to a limited, yet fun experience, featuring quite the nasty ol’ cat. Meow? 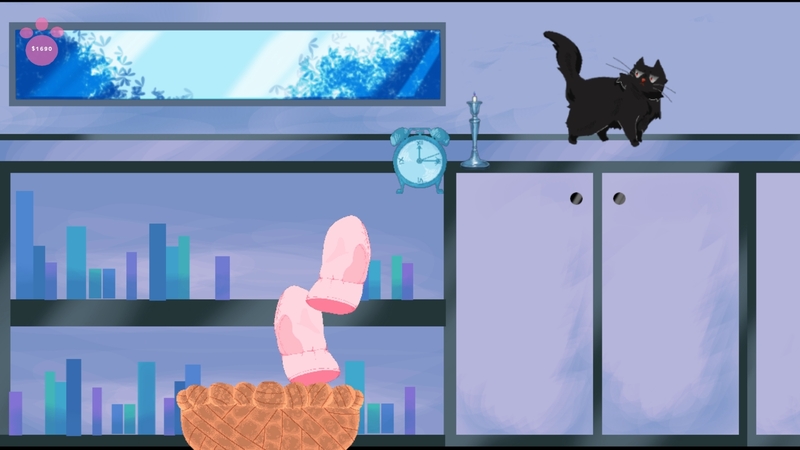 Cat-A-Strophic is available for free on itch.io.